Denver—June 22, 2017—361 Capital, a leading boutique asset manager offering distinctive investment strategies to institutions, investment advisors and their clients, was recognized by the Managed Futures Pinnacle Awards as the 2016 Best Single Sector CTA for its 361 Global Managed Futures Strategy Fund (AGFZX). The Fund uses a proprietary investment methodology that seeks to harvest market uncertainty, using behavioral investing measures to identify periods when fear and greed are present, and then to profit from these emotions by taking positions (long, short, or cash) in equity index futures contracts across the globe. As of March 31, 2017, the Fund ranks 2nd in the Morningstar Managed Futures category among 132 funds based on total return. 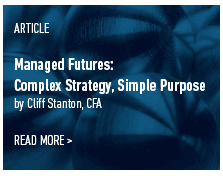 This is the Sixth Annual Managed Futures Pinnacle Awards recognizing excellence exclusively in the managed futures space. Presented by CME Group and BarclayHedge, the Awards honor the top managers in the industry today. For more information about the 361 Global Managed Futures Strategy Fund, or for questions about implementing to alternative investment products, contact 866‐361‐1720. 361 Capital was founded in 2001 with the singular mission of offering distinctive investment solutions that generate meaningful alpha for our clients. Today, as a leading boutique we offer alternative and traditional long-only equity strategies at the cutting edge of evolving markets—uniquely designed to meet investor goals of growth, risk management and diversification. 361 Capital is majority employee-owned with strategic investments from Lovell Minnick Partners, a private equity firm and Lighthouse Investment Partners. For more information, call 866-361-1720 or visit 361capital.com. Investing involves risk, including possible loss of principal. Futures prices can be very volatile. The small margin required for futures contracts magnifies the effect of market volatility and allows the loss from a contract potentially to exceed the Fund’s initial investment. With short contracts, the loss is theoretically unlimited since the appreciation of the underlying asset also is theoretically unlimited. Foreign investment entails additional risk from adverse changes in currency exchange rates, lax regulation, and potential market instability. Frequent trading by the Fund may reduce returns and increase the number of taxable transactions. Concentration of its portfolio in relatively few issuers may make the Fund more volatile than a diversified fund. Morningstar rankings are based on total return, including the reinvestment of dividends and capital gains. Rankings shown are for Class I Shares and may be lower for Investor Class Shares due to higher fees and expenses. Mutual funds are assigned a rank within a universe of funds, relative to a peer group and similar in investment objective as determined by Morningstar. The lower the number rank, the better the fund performed compared to other funds in the classification group. The fund was ranked 56th out of 97 Managed Futures funds for the 3-year period ending March 31, 2017. Past performance is no guarantee of future results. Data from the BarclayHedge Database is used to determine the winners. The award was for the one year period ending December 2016. All winners are nominated based on quantitative data provided by BarclayHedge for the various award categories. The 361 Global Managed Futures Strategy Fund won for the Single Sector category, which includes CTAs that trade just a single sector rather than multiple sectors. All data is collected and analyzed by BarclayHedge.